Lithuania's designated Prime Minister Saulius Skvernelis addresses before swearing in office in the Parliament in Vilnius, Lithuania, December 13, 2016. VILNIUS - Lithuania’s government lost its majority in parliament on Saturday after the junior coalition partner, the Social Democrats, decided to jump ship after less than a year in power. A parliament vote on next year’s budget, expected by early December, will be the first test of viability of the minority government, which will need to convince opposition parties to support it on a case-by-case basis. The Lithuanian Farmers and Greens Union, the sole party remaining in power, have a block of 57 members in Lithuania’s 141-seat parliament. The country, once ruled from Moscow but now a member of both the European Union and NATO, is in the process of rebuilding its military in the face of an assertive Russia but has found development hampered by emigration and raising wages, which eat away its competitiveness. 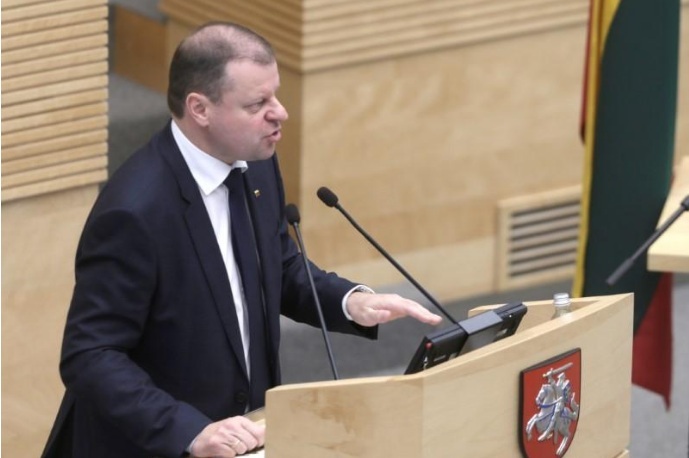 “All preconditions are in place for our government to continue until the next general election in 2020,” Saulius Skvernelis, prime minister since November 2016, told Reuters. “The Social Democrats took a short-sighted and suicidal decision,” he added. Skvernelis said he wants Foreign Minister Linas Linkevicius, a Social Democrat, to continue in the government regardless. Linkevicius was not immediately available to comment. At least one of the two other Social Democrat appointees will leave the 15-member government, said Social Democrat chairman Gintautas Paluckas, elected in April this year on a reform mandate. “Relationships within the coalition were bad, our opinions differed on almost all major issues and, since Farmers and Greens looked for votes elsewhere, we had scant possibilities to shape its politics,” he told Reuters, explaining the party’s decision. The Social Democrats, which have held power for long stretches since Lithuanian independence, have been looking for a way to reconnect with the voters after finishing a distant third in the 2016 general election. Lithuania’s government lost its majority in parliament on Saturday after the junior coalition partner, the Social Democrats, decided to jump ship after less than a year in power.